The Olight S1R Baton II comes in a beautiful cardboard box with all the main features of the product on it. The measured data are to be considered peak (taken within 30 seconds from the ignition and with a fully charged battery) and all have proved to be consistent with what was declared by the manufacturer. 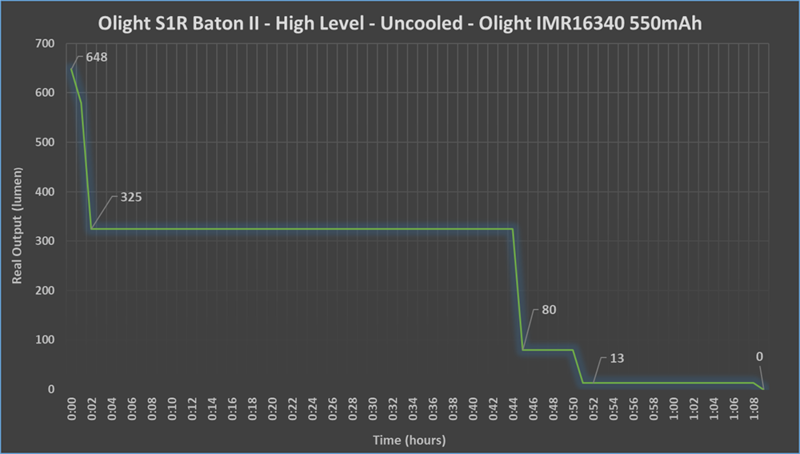 Here are the runtime tests on the Turbo and High levels, using the supplied 550mAh cell as a power supply. ON/OFF:Click the side switch once to turn the light on / off. CHANGE OF BRIGHTNESS LEVEL:When the flashlight is on, press and hold the switch to cycle the Moon-Low-Mid-High-Turbo levels. MOONLIGHT: When the flashlight is off, press and hold the switch for more than one second for direct access to the Moon mode. TURBO:Press the switch twice to access the Turbo mode directly. STROBO:Quickly press the switch three times to activate the strobe mode. TIMER:The S1R Baton II has two automatic shutdown timers, one of 9 minutes and one of 3 minutes. While the flashlight is on, double-click and hold the switch on the current level to access the timer settings. A single click allows access to the short timer, while a double click allows access to the long timer. The flashlight will automatically turn off when the timer expires. To exit the timer configuration, simply double-click and hold the side switch. LOCK/UNLOCK:When the torch is off, press and hold the side switch (for about 2 seconds) to lock the torch (the torch will enter Moon mode first and then turn off). In lock mode, if you press the switch for less than one second the red indicator under the switch will flash to indicate that the torch is in electronic lockout. To unlock it, just press and hold the switch for over a second until the torch is lit. The Olight S1R Baton II is a very small EDC that with its 23mm diameter, 63mm in length and a weight of just over 50g is very convenient to keep in your pocket and always carry with you. Like all Olight torches this model is well finished and cared for in detail and offers a good power in terms of maximum brightness and excellent adjustment on all levels. When touched, it immediately gives a sensation of excellent workmanship. The materials are of quality, the abundant thicknesses. The S1R can be dismantled essentially in two parts by simply unscrewing the lower part of the body. The lens is of the TIR type with diffusion characteristics. The lettering is well done and present in the lower part of the head with the company logo, the model and the serial number of the product. The electronic switch is placed on the side and allows access to all the torch functions. This is in rubber, slightly protruding, and at the pressure it makes a little noisy click. Very easy to find even in total darkness, it offers excellent tactile feedback and ease of use. When the Moonlight level is used the status LED remains off. At the negative pole, which, as for other Olight, is on the side of the head, we have a small, thick golden spring. The particularly abundant section allows an excellent passage of current. On the positive pole there is a double spring which allows contact with the battery. The threads are sliding, well lubricated, anodized and therefore the physical lock-out of the interface is allowed. 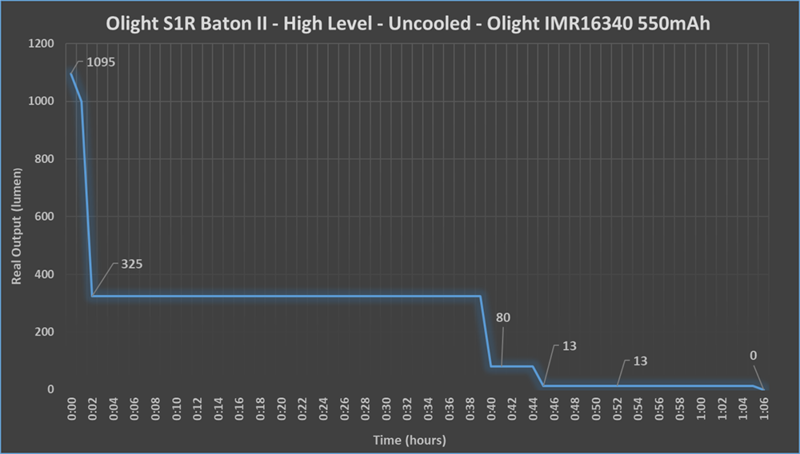 The S1R Baton II can be supplied with a proprietary Olight 16350 cell included in the package. This has a special positive pole designed specifically for the integrated charging system. Before using the S1R we must remember to extract the insulating tab that prevents the cell from making contact. A small charger is also supplied. The presence of a magnet allows you to connect the torch to the cable very quickly, just bring the parts together. The tail is flat. Here is a powerful neodymium magnet to attach the torch to any ferromagnetic surface. A small hole allows you to attach a wrist strap. Already installed on the flashlight, comes a beautiful metal clip that provides excellent grip on any type of garment, belt or pocket. The S1R is a small flashlight that is easy to carry or keep in your pocket. I would see it very well as a flashlight or purse, very light only 54 grams battery included The equipment is very rich, we have many accessories. The power and runtime are good and allow you to cover almost all the needs of everyday use. The regulation is excellent, the interface is simple and intuitive. Very beautiful aesthetically and well-kept in the details. Personally I liked it a lot. Definitely a product to be recommended. Well done review and great pictures!